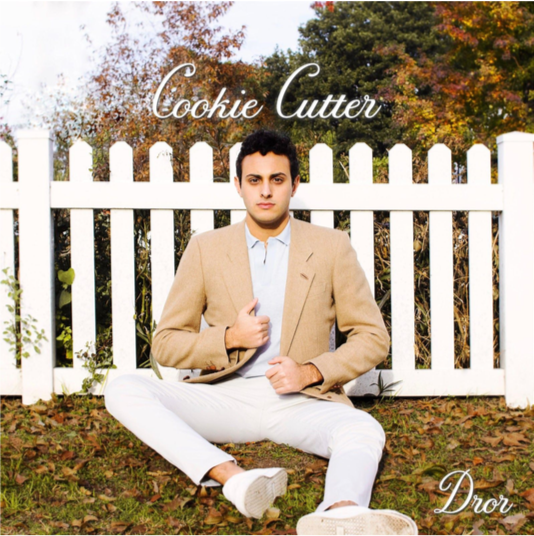 As millions of Americans prepare to flock to their hometowns and avoid familiar faces of their past this holiday season, the second single by Dror, "Cookie Cutter," is the perfect drop. Dror announced the coming release​ ​​in his interview with Milk​​,​​ and said that “Cookie Cutter” was inspired by the superficial environment he encountered growing up and societal expectations around him. Dror wrote the soulful RnB, pop tune to express his feeling of not belonging and wanting more out of life. Texas-based Dror has been working hard to carve out a place for himself in the Austin music scene. With a fresh sound reminiscent of Mike Posner, and a style inspired by Elvis Presley, Dror fits right into the rebellious-pop trend set forth by artists like Khalid and Alessia Cara. He knows exactly who he is and who he is not. Dror gained fast notoriety after a clip of his was featured on The University of Texas at Austin's Snapchat Campus Stories, in which he performed an original 10-second hook written in his freshman year dorm. Dror's Snapchat clip quickly became the talk of 50,000+ students, and the hook evolved into a full song. The release of his music video for "Put ‘Em Up," a spirit anthem for UT Austin, went viral, receiving national coverage and launching Dror's career in the music industry. Over the past year, Dror has worked with many of Sony Music’s biggest acts, fueling marketing and social media strategy for artists ranging from Diplo to Tim McGraw and Faith Hill to H.E.R. He is now stepping into the spotlight to debut his own work. This second single from Dror shows maturity and true artistic development. Old school vibes pair with modern beats and production to create Dror's distinct style, while thoughtful lyrics express emotions we can all appreciate.